I suppose this entry title may seem premature. It should probably read “Realizing Rovender Kitt”. 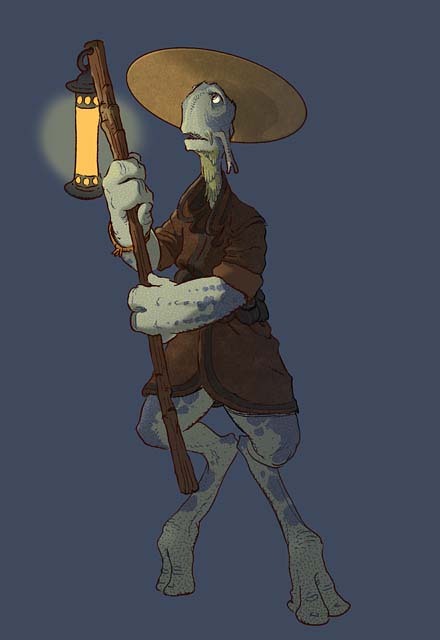 After all, it is a little early to reminisce about a character which you’ve likely only met this past year in The Search for WondLa; but Rovender – the roving wanderer – has been traveling through my imagination for over a decade. For me, he has been a driving force behind these stories, reappearing in my life on-and-off since I first sketched him back in 1996. 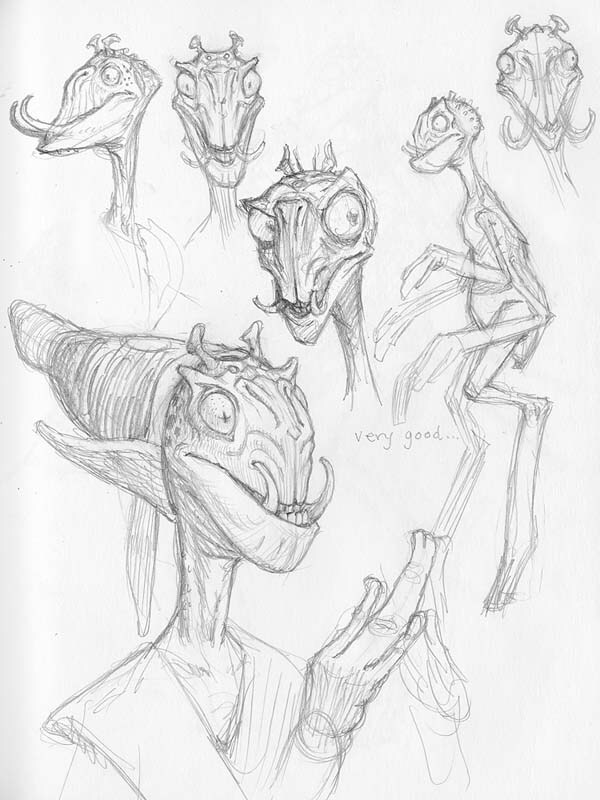 Like many of my stories, the inception of WondLa began as sketches. 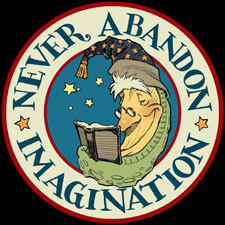 I was thinking fondly of Jim Henson’s fantasy films, fairy tales, and the visions of French artist, Jean Giraud Moebius. From this inspirational pool came a character simply called “The Traveler”. 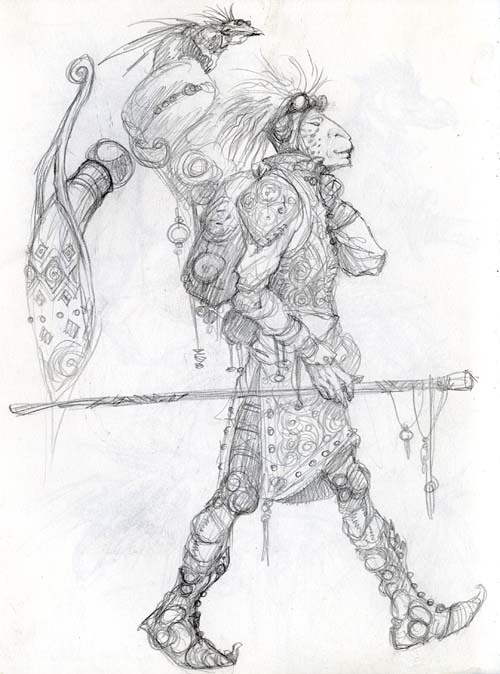 This first drawing came to me while I was still working on role-playing games, like Planescape. And you can see in the drawing above, shapes and forms similar to the characters I had designed for that game. But there was something more to this sketch, something alive. This was a character I yearned to construct a world around. Over the next year I worked on a myriad of freelance projects and began to seriously develop the manuscript for my first picture book, Jimmy Zangwow. 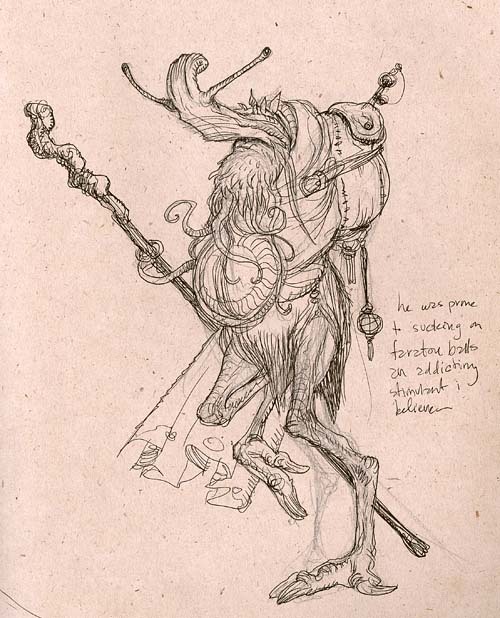 From time to time, I would revisit the story of The Traveler in my sketchbooks. I started to craft a fantastic alien landscape for him to explore. 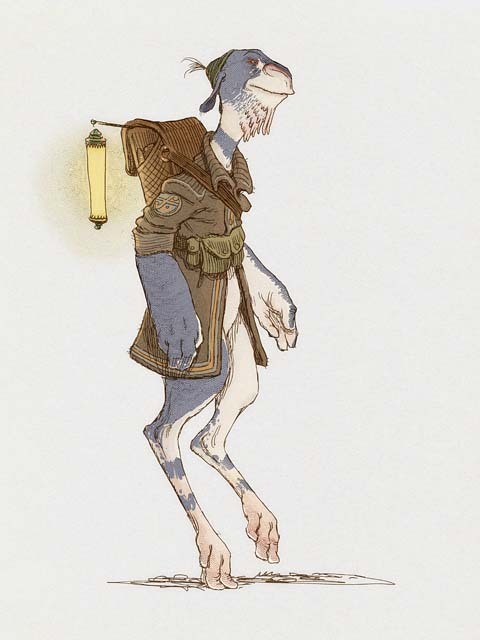 I realized that this Traveler was some sort of alien himself. And yet, despite his alien-ness, he was someone I was sympathetic to. Perhaps it was his searching for his place in the universe that echoed my own yearning to find a niche for my creativity. As I began to understand who this character was on the inside, I tried to figure out what he looked like on the outside. My first attempt was an extremely alien being, as seen in the pen & ink sketch above. But that form was too bizarre and I returned to a humanoid figure. This time I infused it with some of his personality. 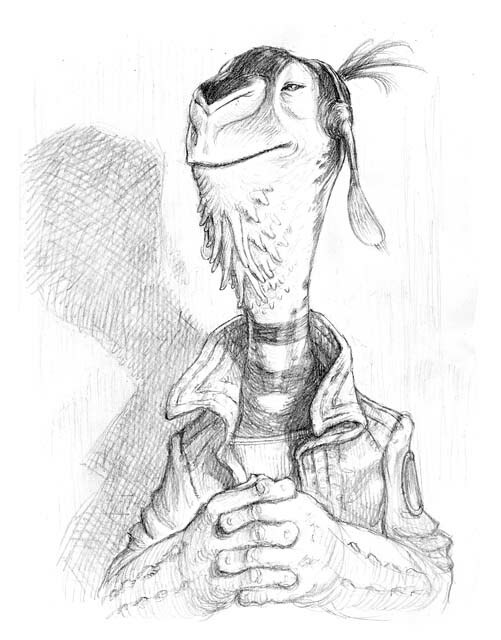 I wondered what it would be like if this character was frustrated, moody and not an easygoing wayfarer. This certainly reflected my own frustration at the time as I labored to break into children’s publishing. 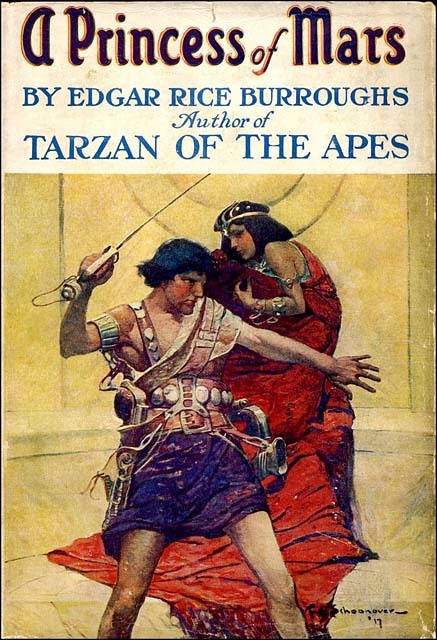 In Part 2: Edgar Rice Burroughs helps me out. Back in August of 2003, as I began work for the fourth Spiderwick book, I started thinking about re-illustrating a classic text after the Spiderwick series was complete. I spoke with my editor at the time, Kevin, and he thought it a good idea – especially given how well my rendition of The Spider & The Fly was received. 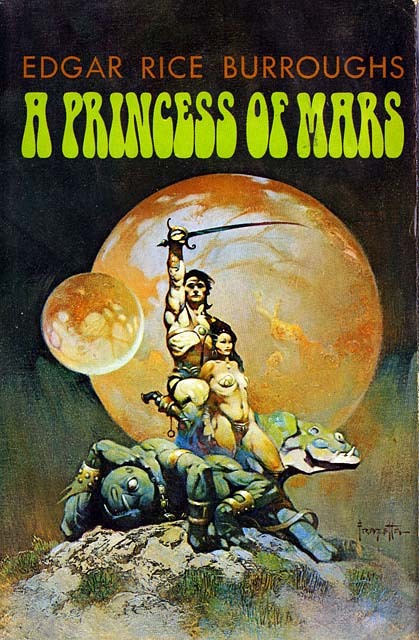 We discussed lesser-known classics that might be enjoyed by readers of today and arrived at Edgar Rice Burroughs’ A Princess of Mars. Like his other classic, Tarzan of the Apes, Burroughs’ sci-fi adventure was action packed with lots of fighting, rescuing and all around swashbuckling. I loved it when I first read it in middle school and I still love it today. Aside from the coveted Frank Frazetta Doubleday editions, which came out in the 1970’s, no one had really tackled publishing a re-illustrated edition since Frank Schoonover painted the illustrations for the 1917 first edition. Excited, I began to re-read A Princess of Mars with sketchbook at my side. 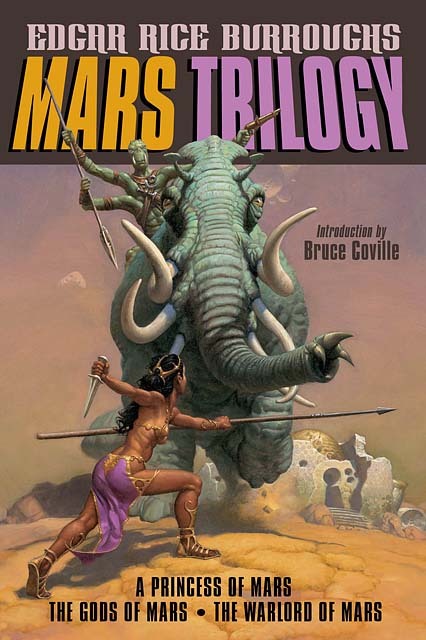 I soon theorized that to bring in a new audience of young readers I would initially shift my focus away from the human characters – like the hero, John Carter, or the martian princess, Dejah Thoris – and spend time on the unique alien life forms. More specifically: the unusual four-armed Tharks, the tribal aliens that John battles throughout most of the story. It was in their redesign that I focused most of my creativity. As I worked through the variations of Burroughs’ martians, I thought of my own story centered around the wandering alien. I revisited (what would become) Rovender’s design during the Princess of Mars sketch session. As I do so, I infused some of my Thark designs and felt like I had made some serious headway on his general appearance, which in turn, began to inform his personality. 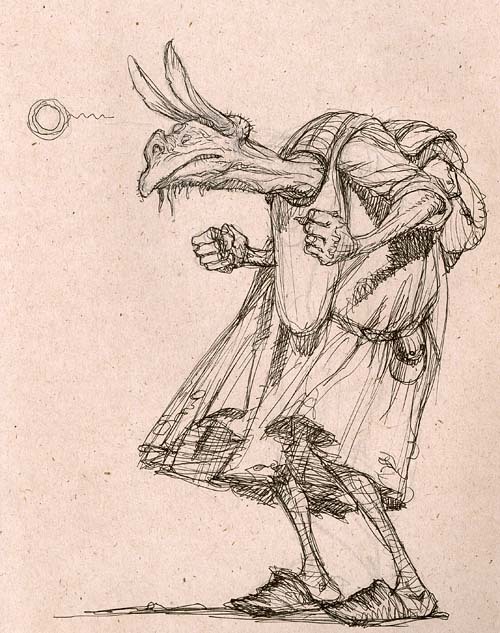 In the end, Spiderwick‘s success and hectic schedule did not allow me the time to illustrate A Princess of Mars. I did continue with my “new take on a classic” idea and it evolved into Kenny & The Dragon. The energy for designing the characters for Burroughs’ world went into designing characters for my own world. But, as a nod, we designed the WondLa logo to harken back to those old John Carter books that I cherished. Over the years, I wondered if I’d made the right move in letting A Princess of Mars slip away. I remember having a chat with Brian Selznick about this very thing: spending time and energy illustrating a classic versus your own material and he concurred that, despite the allure, my choice to focus on my own stories was the best decision. After all, the original text will always have its original illustrator – Alice’s Adventures in Wonderland has Sir John Tenniel, Winnie-the-Pooh has Ernest Shepard and so on. Perhaps, one day, my name will become synonymous with certain texts. I suppose only time will tell. PS – Last year, I was approached by my WondLa editor, David, about illustrating the first three Mars books by Burroughs – Yes! A second chance! To say that I was over the martian moons would be an understatement. But reality set in and I realized my workload had changed very little since 2003 (a good problem to have for sure). Even though I already handed in a cover sketch (seen above), I had to pass once again. In turning down the offer, I did send over a dream-list of illustrators who I thought could really bring Mars to life. I included established names as well as up-and-coming talent. Simon & Schuster is set to publish two books (the first three Mars stories in one volume and a new anthology – both illustrated), which will be released in February of next year. They hired many of the names on my dream-list including friend (and fellow Magic the Gathering artist) Mark Zug for the marvelous painted covers. I’ve had a sneak-peek at some of the interior art and it is awesome! 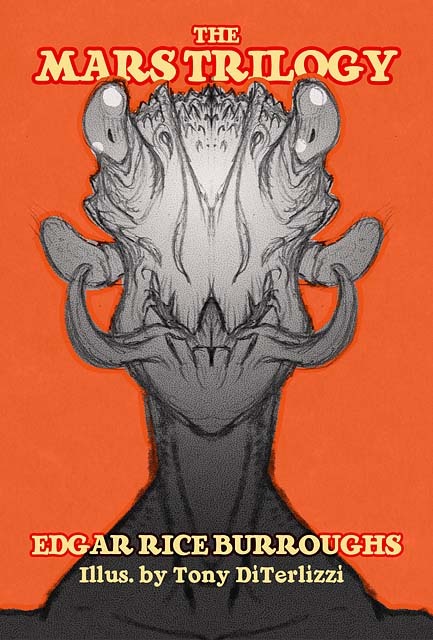 In Part 3: As WondLa becomes a reality for me, I refine Rovender’s design while trying to keep from becoming too Star Warsy. Let me start off by saying the obvious: I am a Star Wars nut. I was seven years-old when I was first whisked off to a galaxy far, far away. I’ve collected the toys, the ephemera, met the actors…heck, I’ve even reported on Star Wars. Like many of us, George Lucas’ vision had a tremendous impact on my imagination as I am sure Buck Rogers and Flash Gordon had on his. 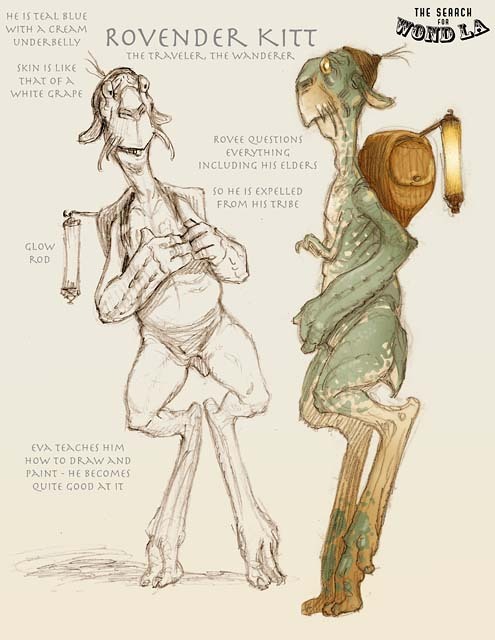 As the story and characters of WondLa developed, I conjured up the things I loved about Star Wars. My hope was to instill some of that boyhood wonder into my own story. After toying with the possibility of re-illustrating Edgar Rice Burroughs’ A Princess of Mars, I found a form and shape that I liked for my alien character…but something wasn’t quite there yet. He looked a little lighthearted, perhaps a bit comical, and that wasn’t the curmudgeonly mentor figure that I was writing about. 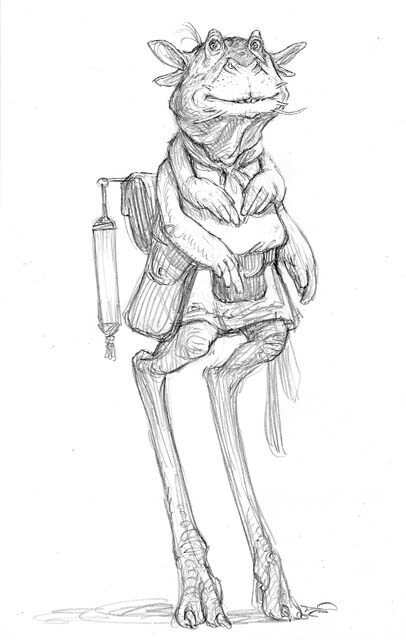 So I held onto aspects of his design that I liked, such as the long legs and thick forearms – features that seemed Star Warsy, but not too Star Warsy (its an adjective. You know what it means. Feel free to use it). The face was a different story. I wanted a face that spoke of intelligence before the character itself spoke. I wanted a face that could express emotion. A face that could act and convey what the character was feeling from my line-drawn illustrations. This “cat-frog” design didn’t work for me. 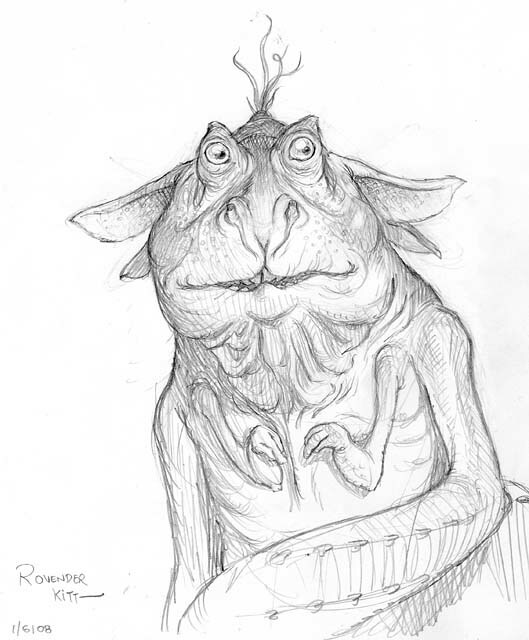 Somehow, Rovender looked too much like a Spiderwick creature here, and I wanted a character design that said “alien”. Then, one night while watching a documentary on penguins of the Antarctic (from the BBC’s Planet Earth series), I sketched this. This looked like an alien that was intelligent, that could talk, that was capable of expressing many moods. And the flight jacket was just the right amount of Star Warsiness that I wanted (you can use that word, too). On top of that, I’d hit upon the notion of “distinctly-marked” alien types as opposed to incorporating the earthy, mottled patterns I had continually used in Spiderwick. (Bear in mind, this was back in 2008, so I had no idea what sort of brightly-patterened aliens James Cameron was cooking up for Avatar ). …but ended up with a pattern that used elements of both. The Lima bean green skin-tone changed as the story evolved. Rovender is described as a washed-out cerulean at the beginning of the tale, but becomes a rich iridescent blue by the end. Here he is from the cover to the paperback edition, due out early next year. Rovender’s role as Eva’s mentor will change and grow throughout the second story and this will continue into the third. Though his physical form is finalized, I plan on trying out various costume and accoutrement combinations so that his look remains interesting. It has been a wonderful journey so far, and I can’t wait to see where this roving, wandering alien takes me next.